They are outstanding performers in their own right. They are highly respected in the field of performing arts and are a treasure house of wisdom. All of Saptak's faculty comprising of 20 members are professional artistes who regularly perform at concerts both in India and abroad. Born into a family of rich musical tradition, Ustad Shaukat Hussain's initiation into the world of music began at the age of five, under the tutelage of his father the legendary Late Ustad Sharafat Hussain Khan ' the doyen of the Agra-Atrauli gharana. Ustad Shaukat Hussain's prodigious talent blossomed. Later after his father's demise, he received guidance from his maternal uncles Ustad Yunus Hussain Khan and Ustad Mubarak Ali Khan. He continues to take guidance from Smt Pumima Sen, a disciple of Ustad Sharafat Hussain Khan. Ustad Shaukat Hussain Khan has emerged as one of the leading exponents of the Agra atrauli Gharana. Blessed with a mellifluous voice ranging over three octaves, his rendition displays a perfect command over bol-baat, bol-taan and laykaari- that are distinctive features of his gharana. He is currently the divisional head for vocal music at the Saptak school of music, and provides invaluable guidance for young, aspiring singers. Address ' 14/10, Tulsishyam Soc.,Bhimjipura, New wadaj,Ahmedabad-13. Education 'Ph.D. in music(VOCAL)Gold medalist Shiksha Visharad. 25 years in Gandharava Mahavidhyalaya in Ahmedabad as a Music tutor. As a music tutor in SAPTAK School of music since 2002. As a composer in Prachya Mandal since 1994. As a visiting faculty in J.G. College of performing arts. Achievements 'B. hi. Grade in Akashvani, Live performances in various Cities of India i.e. Chennai,Godhara, Patan, Ujjain,Junagadh and Ahmedabad. 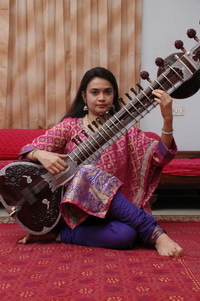 Pratima Anandjiwala has been learning the sitar since the age of 17 from Smt.Manju Mehta. 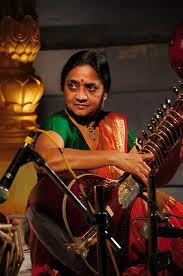 In the year 1985, she won the first prize in the prestigious Gujarat State organised Pt.Omkarnath Music Competition. Pratima performs regularly on the All India Radio as a B 'high' grade artist and also occasionally on the television. 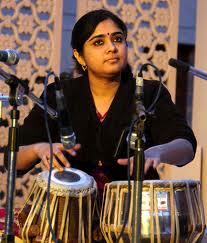 She has also performed at the Saptak Annual Festival and is at present on the faculty of Saptak School of Music. Amita Dalal started learning the sitar from the age of eighteen from her guru, Smt. 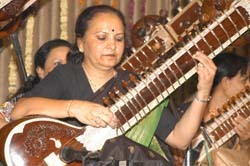 Manju Mehta, a disciple of Pandit Ravi Shankar. A gift sitarist, Amita toured Japan in 1978, under a student exchange programme and performed in the Osaka & the Syongunyama festival. In 1980, upon winning a prestigious music competition she was selected by the state government to represent India for performing in the cultural events in the Olympic games in Moscow where 84 countries from all over the world had participated. Amita performs regularly on the All India radio under the B-high graded artist category and was also the winner of the state cultural awards 'The Navdeep Pratishthan' awards in 1994. She is attached to the Saptak School of music and has performed in 1994, 1996, and 1997 in the annual Saptak music festival. She has also performed in other cities of India such as New Delhi, Bangalore, Bombay, Baroda etc. Born into a family of musicians, Poorvi Mehta has inherited her talent for music from her parents. She began to take lessons from her mother Smt. Manju Mehta, a celebrated Sitarist, from a very young age. With sheer perseverance, Poorvi Mehta has matured into a very fine Sitarist and is now recognised as a 'A' Grade Sitarist of All India Radio & Doordarshan. Her virtuoso performances and concerts include the National programme of music of AIR, the Tuesday night concert, Baiju Sangeet Samaroh and the prestigious Pt. Omkarnath Thakur Samaroh organised by Gujarat State Sangeet Natak Academy. She also has performed at various concerts across India. At present, Poorvi is associated with the Saptak School of Music as a faculty member. When not engrossed in music, it is English Literature that interests her and Poorvi has completed her M. Phil in the subject from the Gujarat University. Born into a family very well known for its cultural heritage in Ahmedabad, Bijal Shah started his initial training in the flute very early in his school days at the Mayo College in Ajmer, India. Simultaneously, he continued to pursue his training vigorously under the tutelage of Smt. 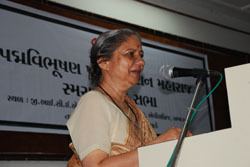 Manju Mehta. A recipient of the second prize in the state level Pt.Omkarnath Thakur Competition Bijal has been a regular performer on the All India Radio and Television since the last 15 years and is registered as a B-high graded artist. He has also been recognized by the Government of Gujarat. He has also had the opportunity to perform in various Saptak concerts as well as other music concerts in the country. Presently, besides performing, he is a faculty member at the Saptak School, where he teaches the flute. Graduating in Mathematics from St.Xavier's College, Ahmedabad, Bijal works professionally in a consultancy business owned by his family. Born in a family with great respect and appreciation for music, Vinod Vaishnav started his formal training in Tabla at an age of 18. Since the very beginning, he took his training in Tabla under the able guidance of Pt. Nandan Mehta, a renowned and senior most disciple of Padma Vibhushan Pt. 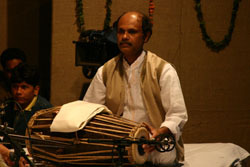 Kishan Maharaj of the Banaras Gharana. He was trained under the traditional Guru-Shishya Parampara. During the period of learning under Pt. Nandan Mehta, he also received guidance from Pt. Puran Maharaj, son of Pt. Kishan Maharaj, and Pt. Kishan Maharaj himself during their visits to Ahmedabad. The blessings of these Gurus have developed Vinod Vaishnav into a refined exponent of the Tabla in the pure Banaras Gharana style. He won the first prize in percussion segment at Pt. Omkarnath Competition organized by Gujarat Sangeet Natak Academy in 1985. He has given performances in various cities across India including Mumbai, Delhi, Agra, Meerut, Jaipur, Indore, Bhopal, various cities of Gujarat etc. He has performed at major concerts including Maharshi Vishnu Digambar Sangeet Sammelan, Akashvani Sangeet Sammelan, Pt Omkarnath Festival, Baiju Sangeet Festival, Tana-Riri Sangeet Festival, Akashvani National Program of Music, Akashvani Tuesday Night Concert, etc. He has accompanied many famous artists including Padma Vibhushan Pt. Jasraj, Padma Bhushan Pt. Rajan-Sajan Mishra, Padma Bhushan Smt. N. Rajam, Padma Shri Pt. Vishwamohan Bhatt, Padma Shri Pt. Gokulotsavji Maharaj, Ustad Sultan Khan, Padma Shri Smt. Shubha Mudgal, Pt. 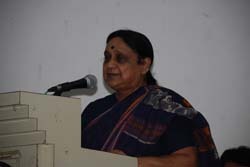 Shashimohan Bhatt, Smt. Manju Mehta etc. Also, he is a regular artist at All India Radio and Doordarshan. He has served as a judge in competitions organized by Gujarat State Sports and Cultural Activities Division. 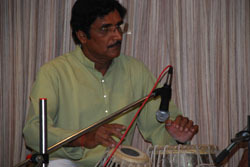 He has also been a member of the selection committee for Tabla at Music College, M. S. University, Baroda. He has been a faculty of percussion at Saptak School of Music, Ahmedabad since several years and has trained a large number of students over these years. Rajal Shah's initiation into the world of Indian classical music began at the age of 8 when he started learning the tabla in Banaras gharana tradition under Pt. Nandan Mehta . Subsequently, he also trained under Pt.Pooran Maharaj. Among his various accomplishments, Rajal won the first prize in the state level Pt.Omkarnath Thakur competition and has performed at various Saptak concerts as well as other music concerts in the country. A B-high grade artist of Akashwani and Doordarshan, he performs regularly at All India Radio and Doordarshan. He has accompanied several maestros like Padma Vibhushan Pandit Jasraj, Padmashree Ustad Sultan Khan, Padma Vibhushan Pt.Rajan Sajan Mishra, Padmashree Pt.Vishwa Mohan Bhatt and many other young upcoming artists of our country. Presently, besides performing, he is a faculty at Saptak School of Music in the department of Tabla. Born on 7th December, 1960, Hemant Bhatt belongs to a very well-known musician family of Jaipur and had his initial learning in Pakhawaj from late Shri Sadashiv Rao, desciple of late Shri Govind Rao Burhanpurkar of Nana Saheb Panse Gharana. He had also received training from Shri Gokulotsavji Maharaj and Shri Vasant Raoji of Pune. He won prize in the state level Pt. Omkarnath Thakur music competition. He has accompanied to eminent Indian classical musicians at the annual Saptak Music festival and other concerts since the last 30 years, which in turn has helped him to further expand his art. He has also had the opportunity to perform in various Saptak concerts as well as other music concerts in the country. He is a B-high grade artist of Akashwani and Doordarshan. He has given performances at All India Radio and Doordarshan. He has accompanied many senior artists in public performances at various locations in India. He has accompanied veterans like Padma Vibhushan Pandit Jasraj, Padmashree Pt. 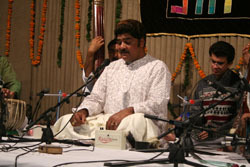 Vishwa Mohan Bhatt, Ustad Sayiduddin Dagar, Pt. Kartik Kumar, Smt Manju Mehta and many other young upcoming artists of our country. Presently, besides performing he is a faculty at Saptak School of Music in the department of Pakhawaj. Besides accompanying he has also distinguishably given Solo performances in many concerts. Pravin Mahadev Shinde has had a long association with Saptak. He began to learn tabla under the guidance of his father, Shri Mahadev Ramchandra Shinde and later went on to be mentored by Shri Vinod Vaishnav, Shri Pooran Maharaj and Shri Nandan Mehta. As a student he went on to win the Pt.Omkarnath Music Competition organised by the Gujarat State Sangeet Natak Academy in both the Junior and Senior categories. An accomplished tabla player he has accompanied several leading artistes and musicians in various concerts across the country.